When creating a map in SmartConnect for a Dynamics GP destination, you would typically click on the Companies button and select the company or companies you want the map to integrate into. I’ve blurred out my company names but you can see I have several to choose from. However, I have not selected any in this map (a GL transaction map in this case). Why not? Well, I’d rather put the company selection in the hands of the user running the map and I choose to do that via the Define function. For many of the maps I create for our staff and for clients in my previous consulting life, the things they want to integrate aren’t limited to 1 company. At the very least many customers want to upload into a Test company to test something before integrating to a regular production company. This is where the Define functionality (under the Companies button in SmartConnect) comes in. In the companies window, leave the companies themselves unchecked. Click on the Define button. 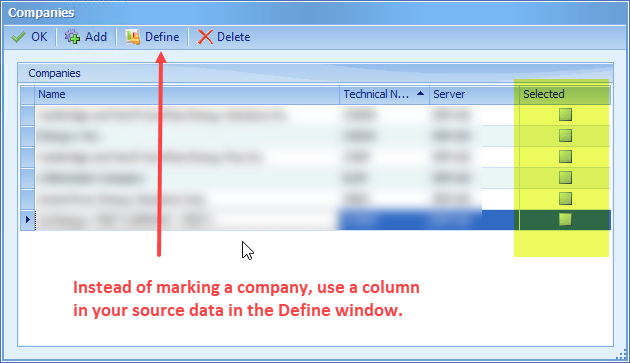 Ensure your data source has a company column (it can be named anything, “company”, “database”, etc.). 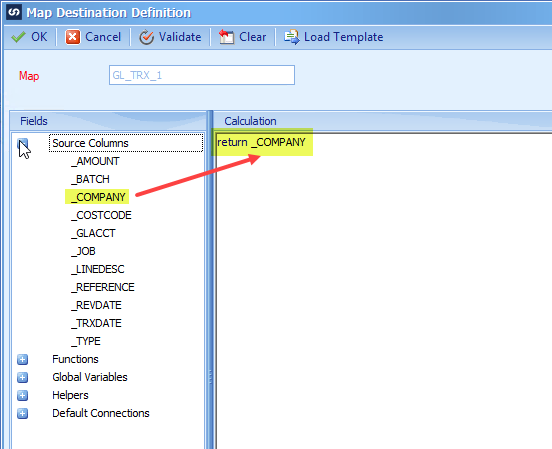 As long as there is some data in the source that you can determine what database to integrate to, you can use the Define feature (for instance, with If/Then statements to tell SmartConnect what to map to when). In my case, I have the users put in the actual database name in the “Company” column in the source Excel templates. If I wanted to make this “next level”, I could have the users put in a code for the company that they would easily remember and use some IF/THEN statements in here to map from the short code to a database name (for example, the users could put keywords in such as TEST or PROD and you map those to specific companies if you have a 2 company scenario). In the simplest form, if the source document template has the database name like mine does, you simply want to define the company as “return <yourcolumnname>”. Where else could you use this? You could integrate to multiple companies in one map at one time. For example, at a previous client, I created a template for their month end journal entries. They would have a standard set of entries that are for various companies. Their template was in Excel and they had multiple entries on one tab, with entries for different companies. They would run the map once and with this Define feature, SmartConnect would integrate the journal entries into each company, seamlessly, as if they had run the integration once per company. That’s it for this tip, I hope you find it useful!